Hello everyone! We hope everyone is doing well and having fun with their machines. We wanted to post out a couple of updates just so that everyone is up to date on the latest things going on here. We are proud to announce that we have a completely new firmware ready for testing that will be the new Unified Firmware Revision 2. This is based on the Marlin 1.1.9 branch and brings a plethora of new features. This even includes POWER RESUME! The Creality 3D power resume code has been integrated into the Marlin 1.1.9 code. While it does work it does have some bugs just like the Creality version does. Even though it is in the firmware we do NOT provide support for it if it doesn’t work correctly or causes issues. This feature also writes excessively to the SD card and could reduce the life span of the card. It is disabled in our firmware by default. There are new Jerk and Acceleration algorithms in the new release as well and are disabled by default. We have not experienced any issues aside from faster and cleaner prints. They are located in the MISC section of the configuration.h file. This works on all boards but will be disabled should you enable the power resume due to RAM limitations on all printer boards supported. There are numerous new features on the backend and general optimization that has been done to the new release by us and the Marlin team. This firmware is very “polished” and runs great. Give it a try! Right now orders are taking 1-2 days longer than normal to ship out. This is due to BOTH our employees that help with kit assembly and product packaging being out. Our main person, Tyler, had to get his tonsils removed due to repeat infections and will be out for about 2 weeks. Our other guy, Danny, was only here for the summer for school. We are bringing in temp help for the next few weeks and then Tyler will be a full time employee with us instead of part time like he has been. We apologize for the delays and appreciate your patience. We’ve also updated the EZABL Installation guide and even put out a complete video for the installation! A lot of you have noticed that we password protected our installation guide. This was done because Creality was sending people to us to get help with their kit due to the poor quality of their knock-off of our EZABL kit. We had basic password protection but looking around it looks like someone has cracked the password and is distributing it to other people. In addition to that we also found that it was just inconveniencing our customers and creating an influx of support tickets for our support team to handle. We have removed the password protection from our guides and other files that were protected. We hope this was the right move and it isn’t going to just encourage other copy-cats to leech off us for support and documentation. If you see someone online recommending to use our documentation with a non-EZABL kit please politely inform them that we exist and where you can get our kits from. EZABL kits make up a good portion of TH3D’s sales and allow us to put out all the videos, documentation, and other information that we do for free. Without the EZABL kits we would not be able to allocate time to do a lot of what we do. 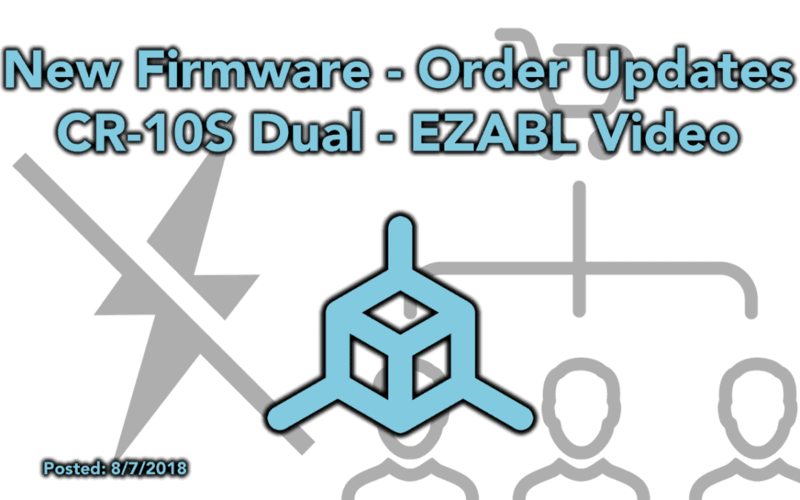 On a lighter note we’ve been hard at work and have put out a complete installation video for the EZABL kits that shows you how to setup everything from start to finish. We hope that you enjoy it. It is not perfect (as the camera we used had some image stabilization issues on a few shots) but other than the 2 jittery parts we feel it came out great and will help out our customers. We opened up another round of the dual board orders and we expect to have them in about 1 week pending no issues with customs. We had to raise the price on the kit slightly as we are getting hit hard with tariffs on the boards themselves due to new US import regulations. As always thank you everyone for your support! Make sure you check out our new communities! Join and check out our Forum. You can sign up with your email or we also support Discord, Steam, Facebook, Google, Twitter, Github, and Twitch for signing up for the forum and sign in.